What’s the Difference Between a Fire Cabinet and a Fire Safe? Do You Need a Fire Safe or a Fire Cabinet? Fire safes and fire cabinets have many similarities but they also possess significant differences which could play a role in the one you choose. How Do Fire Safes and Cabinets Protect Your Contents? Each fire safe and cabinet is also required to undergo extensive safety testing. An average fire will burn a single point for roughly 10 to 20 minutes and typically reaches close to 420°C. Based on this time frame, the safe or cabinet is monitored to ensure that the internal temperature doesn’t rise above a certain point. One of the easiest differences to identify between a fire cabinet and safe is the size. Fire cabinets can easily be two or three times larger than a fire safe. With that said, they can also hold more contents. For example, the Chubbsafes Archive XL Fire Cabinet Size 640 offers a tremendous amount of space for paper documents, files, and even electronics. Since it has the capacity to hold so many files, it may be ideal for a large department within a school or other academic facility. Boasting a £1,000 cash rating and £10,000 valuables rating, this cabinet is fitted with a security key lock to prevent unauthorised access as well as four adjustable shelves for enhanced tidiness. When you think of a safe, the first thing that comes to mind is most likely security. Safes are often one of the best form of defence against burglary and theft because of their top notch locking features and the ability to be bolted down. You don’t, however, have to compromise fire protection for security. A fire safe combines the best of both worlds by offering protection from heat as well as theft. 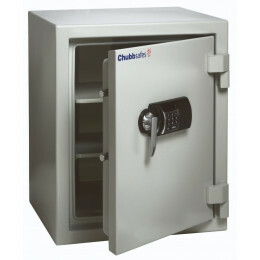 Take the Chubbsafes Executive 65E 1 hour Digital, for example. It has a second tier Bronze level of protection and fire protection for up to 60 minutes. The Roberts Rating is a good indication of a safe’s security level. Platinum is the highest level of protection awarded by the rating system, while Bronze is an adequate entry level rating. Safe Options also denotes the fire resistance level right underneath for your convenience. Choosing the right fire safe or cabinet really comes down to your specifications and needs. For ample storage, opt for a fire cabinet. 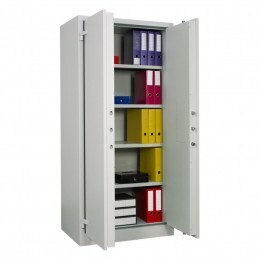 Otherwise a fire safe protects a moderate amount of paper documents from theft and burglary. How do Fire Cabinets Work?